Fruit Tree Basics | Gardens Alive! Q. 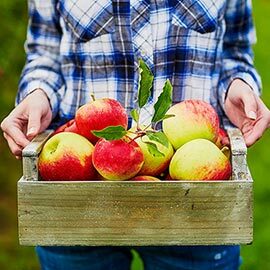 Can I grow Red Delicious apples in my yard from the seeds of store-bought apples? When my mother came here from West Africa at the age of 94 to see her grandchildren for the very first time we picked Red Delicious apples at an orchard together and they became her favorite fruit. That's a time I will never forget, and I would really like to grow at least one tree as a memorial to her. 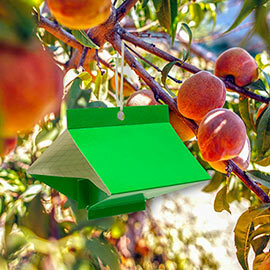 When and what should I use to protect my peach tree from insects and other harmful things? I have a dozen five-year old fruit trees in New York's Hudson Valley. They received no attention after being planted and have not grown very well. Last fall I put a layer of wood chips around them to try and retain moisture, and cut the limbs back hoping to generate more root growth. What is the best way to supply them with a lot of nutrients in the spring? I want something that won't get washed away in the first good rain. A. Fruit trees require much more attention and care than I can detail in a couple of minutes. But this is a good time to discuss the basics—and I have to yell at Sean. Alright. Now, yes, you can grow apple trees from seed; John Chapman (better known as the legendary but very real "Johnny Appleseed") did it over a vast scale. But it is not recommended, for two big reasons. Apples do not 'come true' from seed; that means you never know what kind of apples you'll get. As the old saying goes, "Seeds from even the sweetest apples may bear sour fruit." It adds many years to an already fairly lengthy growing time. So start with purchased trees. Look for varieties that say they're disease resistant; the older the trees the better. And stick with dwarf or semi dwarf varieties in home landscapes. Plant in early Spring or early Fall, but never in summer; on high ground (not down in a frost pocket) in an uncrowded area that gets morning sun. Dig a wide hole so the roots can expand outward, but don't improve the soil in the hole or those roots will stay huddled close to the tree. Fill the hole back up with the nasty soil you dug up; we'll improve it slowly over time by adding compost on the surface. Immediately after planting, let a hose drip very gently at the base of the tree for 48 hours. Repeat for a few hours every couple of days if rain is scarce over the next several weeks. Then be ready to water during any drought—that's a week without rain—the first year. Mulch the ground around the tree with an inch of high quality compost. Start six inches away from the trunk and go out as far as you can. This will feed the tree, encourage the roots to spread, prevent weeds and disease and promote world peace. Do not use wood, bark, triple-premium-shredded anything, rubber, stone, crushed wombats or any other mulch; only compost. And top it off with a fresh inch later in the season. Early in the Spring your trees will flower; enjoy this stunning display, because its pretty much all you're gonna get the first couple of years. Promptly remove any fruits that form the first year, so all the tree's energy goes into growing strong branches, a good root system and not dying. The second year, let a few fruits progress to ripeness and then examine them at the end of the season to see what bugs you'll be dealing with. My only pest so far has been the Oriental Fruit Moth, so I will begin spraying BTK—the organic caterpillar killer—on my trees shortly after flowering. This little bugger eats shoots early in the season and bores into the fruits later, so I'll keep up the sprays. BTK controls other caterpillars as well (including the apple coddling moth) but harms nothing else in the environment; it won't even harm a caterpillar that doesn't eat the sprayed leaves! It is totally pet and people (and bird and fish and beneficial and…) safe. See? I did say it again. When the trees are established enough that you no longer have to remove all the fruits, begin 'thinning' excess ones. Yes, this is emotionally difficult, but you must do it. 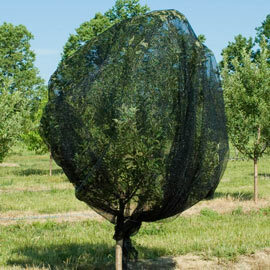 These trees produce many more fruits than they can support, and you must remove at least half early in the season to get good quality full sized ones at the end. Basic advice for apples and peaches is to have at least six inches between the remaining fruits. At the end of the season, it is vitally important to "clean the orchard floor". Rake up that compost mulch, dropped leaves and fruits and trash it all. (Put down fresh compost every Spring.) Over winter, spray the trees with horticultural oil to smother any pests hiding under the bark. Most experts advise winter pruning; I haven't done this yet—my trees are nice and open in the middle and I want them to grow bigger right now. I'll start to prune when they get crowded in the center; but I will wait to do so until right after they flower—I'll get the same disease protection without missing any of that spectacular show. Obviously, this is bare bones advice. But I assure you: Plant the trees correctly in the right spot; feed and mulch them with fresh compost every Spring; thin the fruits every Spring and clean the floor every Fall, and you'll keep problems to an absolute minimum.